There was perhaps no greater female humanitarian during the Civil War era than Clara Barton. She was a woman who wished to do her part to help in the war efforts at a time when women were not allowed in the military. What set her apart from so many heroes of the time was the fact that she cared so deeply about others and lived her life caring for those in their time of greatest need. She began this lifelong endeavor by caring for her sick brother when she was just a kid. She helped wounded soldiers at both Fredericksburg and Antietam where she was nicknamed "Angel of the Battlefield," for her care and devotion to the wounded. Equal right supporter, nurse, civil rights activist, teacher and founder of the American Red Cross are just some of the reasons why she was so highly regarded throughout her life. She leaves behind a legacy of compassion and dedication that are discussed in the facts and interesting information about her life below. Click here for a great selection of Amazon.com books about Clara Barton. The youngest of five children, Clarrisa Harlowe Barton was born on Christmas Day in 1821. Known as a shy and introverted young child with a lisp, Clara Barton did not make friends easily. After offering to take care of her injured brother when she was just eleven, she found that taking care of others helped her to forget her own fears. To further work on overcoming her shyness, she became a teacher in a one room schoolhouse at the age of sixteen where she was credited for her ability to inspire and engage her students. 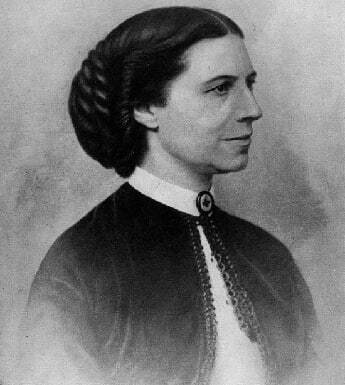 Not wanting to waste any time when the Civil War began, Clara Barton was one of the very first volunteers to arrive on the scene with her own supplies from home to help the wounded soldiers at the Washington Infirmary. After receiving official permission to transport medical supplies where needed, she volunteered at all of the Civil War's major battles. Doctors and nurses in field hospitals received supplies from her and when necessary, she tended to the wounded herself. Soldiers also looked forward to receiving mail and food from her. Clara Barton had no official medical degree or training. When the war ended she spent a great deal of her time marking the graves of those who died in battle, locating missing soldiers and POW's, and recounting her experiences to Congress. After traveling abroad after the war, Clara Barton discovered the International Red Cross on a visit to Geneva, Switzerland. Seeing the value in the organization, she returned home and worked tirelessly for the next decade to create the American Red Cross. She lectured whenever she could, wrote and distributed pamphlets on the subject, and even met with President Hayes to discuss her vision for the American Red Cross. Her efforts were rewarded in 1880 when the American Red Cross was established. She led the organization as president in its mission to provide humanitarian relief to those affected by disaster until she resigned in 1904 at the age of 83. She died from tuberculosis in 1912 at the age of 90.